Have you heard about the latest ‘U turn’ in nutritional science? America, the land of the ‘egg white omelette’, is in quite the tizzy about it all. Just a few weeks ago the US Government’s Dietary Advisory Committee changed the long standing official dietary advice to limit the number of eggs per person to a couple a week. Instead they are recommending people to drastically restrict their sugar intake from an average of between 22-30 teaspoons a day in the US. How shocking is that? Here in Ireland we are not quite as bad at a “mere” 15-16 teaspoons per day but we are getting there fast with many children starting their day with a bowl of sugary cereal and a ‘fruit’ yoghurt or smoothie, which can contain up to 7 teaspoons of sugar. Back to eggs, time for us egg lovers to celebrate eggs. Mankind has been eating eggs, the original fast food since time began. When you think of it they are a wonder food, a neat package of nutrients and goodness. Recent research has found that they contain even more vitamins and minerals and less calories than originally thought. Around 1,000 years ago the Indians and Chinese started to domesticate chickens and then the Egyptians worked out how to incubate the eggs so the hens could get on with the business of laying. If eggs were so bad for us, it’s just possible it would have been evident before the 1960s when some scientists began to connect eggs to heart disease – I thought of my Granpoppy who ate a couple of eggs every day of his life and lived to a ripe old age. But those were beautiful fresh eggs from the flock of hens pecking around the haggard and farmyard and an altogether different thing from the mass produced eggs layed by hens confined in “enriched” cages. For decades many people went to ‘work on an egg’. Then in the 1980’s there was the panic about salmonella in eggs – a natural consequence of overcrowding and intensive production. So how do you feel about eggs? Are you also concerned that they will increase your HDL cholesterol, well fear not the thinking has changed. But remember, an egg laid by a happy lazy hen is an altogether different thing to a mass produced egg to which an increasing number of people are allergic. Why not join the new generation of hen keepers so you can enjoy the pleasure of having a regular supply of proper free range organic eggs. A chicken coop on your lawn with four hens will recycle food scraps, provide enough eggs for a regular household and provide chicken manure for your compost heap. For us cooks, it’s difficult to imagine life without eggs … they are one of the few foods considered to be a complete protein because they contain all the essential amino acids, the perfect package of nutrients and goodness and are super versatile in the kitchen. Like cattle, hens need access to grass to produce real nourishment and flavour. Organic hens must be allowed to range freely but free range does not mean organic and can be a very “elastic” term. Eggs are incredibly good value, two or three for supper makes an inexpensive and nourishing meal. Those of us who are fortunate enough to have some space to keep a few free range hens are blessed indeed. The eggs laid by my happy, lazy hens are completely perfect – white curdy albumen and rich yellow yolks. When you have access to eggs of this quality, treat yourself to a boiled egg – absolute perfection but sadly a forgotten flavour for so many people. Little fingers of toast called dippies or soldiers are the usual accessory but during the asparagus season in May a few spears of fresh green asparagus make a deliciously decadent dip. Bring a small saucepan of water to the boil, gently slide in the eggs, bring the water back to the boil and simmer gently for 4-6 minutes, according to your taste. A four minute egg will be still quite soft, five minutes will almost set the white while the yolk will still be runny, 6 minutes will produce a boiled egg with a soft yolk and solid white. Meanwhile toast the bread, cut off the crusts and spread with butter. Cut into fingers. Immediately the eggs are cooked, pop them into egg cups on large side plates. Put the cooked asparagus (see below) and soldiers on the side and serve with a pepper mill, sea salt and a few pats of butter. Bend the stalks of asparagus, over your index finger. It will snap where it begins to get tough (keep the ends for soup). Cook in boiling salted water for 5-8 minutes (depending on size) or until a knife will pierce the root end easily. Drain and keep hot. A favourite breakfast dish, there are lots of versions, some just crack the eggs onto the top, cover and allow to set but I love this version. salt and freshly ground black pepper, maybe a pinch of sugar. We used a deepish pan with a 7 inch base and a 9 inch top. Heat the oil in a sauté pan and add the onion, peppers and chilli if using. Cover with a paper lid and sweat until soft but not coloured, about 5-6 minutes. Add the tomatoes, season with salt and freshly ground black pepper and a little sugar. Cook for another 4 or 5 minutes. Lightly whisk the eggs, gently season and stir into the base, continue to cook until softly set. Stir gently once or twice then crumble the feta on top. Cover with a lid and continue to cook on the lowest heat for 15-20 minutes until just set. Scatter with roughly chopped flat parsley, a drizzle of extra virgin olive oil and a few chilli flakes if you wish. Serve immediately with lots of crusty bread. Wash the seakale gently and trim into manageable lengths – about 10cm (4inches). Bring the water to a fast boil and add the salt. Add the seakale, cover and boil until tender – about 15 minutes. Just as soon as a knife will pierce the seakale easily, drain it. Meanwhile, melt the butter in a pan on a gentle heat and toss in the prawns to warm through. Serve the seakale with the prawns on hot buttered toast, and drizzle generously with Hollandaise Sauce. Pop a little bunch of chervil on top of each toast and serve immediately. Hollandaise is the mother of all the warm emulsion sauces. The version we use here is easy to make and quite delicious with fish. Like Mayonnaise it takes less than 5 minutes to make and transforms any fish into a feast. Once the sauce is made it must be kept warm: the temperature should not go above 70-80°C/180°F or the sauce will curdle. A thermos flask can provide a simple solution on a small scale, otherwise put the Hollandaise Sauce into a delph or plastic bowl in a saucepan of hot but not simmering water. Hollandaise Sauce cannot be reheated absolutely successfully so it’s best to make just the quantity you need. If however you have a little left over, use it to enrich other sauces or mashed potato. 1 teaspoon freshly squeezed lemon juice, approx. Put the egg yolks in a heavy stainless saucepan on a low heat, or in a bowl over hot water. Add water and whisk thoroughly. Add the butter bit by bit, whisking all the time. As soon as one piece melts, add the next piece. The mixture will gradually thicken, but if it shows signs of becoming too thick or slightly scrambling, remove from the heat immediately and add a little cold water if necessary. Do not leave the pan or stop whisking until the sauce is made. Finally add the lemon juice to taste. If the sauce is slow to thicken it may be because you are excessively cautious and the heat is too low. Increase the heat slightly and continue to whisk until the sauce thickens to coating consistency. Keep the sauce warm until service either in a pyrex bowl over hot but not simmering water (do not have gas jet on). A thermos flask is also a good option. A great way to use up left over Hot Cross as of course this recipe can be adapted for barmbrack. Split the hot cross buns, butter each side and cut into slices. Arrange the slices, buttered side down, in one layer in the buttered dish. Sprinkle the buns with half the spice and half the raisins, then arrange another layer over the raisins. Sprinkle the remaining nutmeg and raisins on top. Cover the raisins with the remaining hot cross buns. In a bowl whisk together the cream, milk, eggs, vanilla extract, sugar and the pinch of salt. Pour the mixture through a fine sieve over the bread. Let the mixture stand, loosely covered, at room temperature for at least 1 hour or chill overnight. Place the pudding in a bain-marie and pour in enough water to come half way up the sides of the baking dish. Bake the pudding in the middle of the oven for about 1 hour or until the top is crisp and golden. Serve warm with some softly whipped cream. Note: This pudding reheats perfectly. This is a fresh tangy light ice cream, is made from milk rather than cream. Easy peasy to make and a delight to eat at the end of any meal winter or summer. Separate the egg, whisk the yolk with the milk and keep the white aside. Gradually mix in the sugar. Carefully grate the zest from the lemon on the finest part of a stainless steel grater. Squeeze the juice from the lemon and add with the zest to the liquid. Whisk the egg white until quite stiff and fold into the other ingredients. Freeze in a sorbetiere according to the manufacturer’s instructions or put in a freezer in a covered plastic container. When the mixture starts to freeze, remove from the freezer and whisk again, or break up in a food processor. Then put it back in the freezer until it is frozen completely. Meanwhile, chill the serving plates. Scoop the ice cream into the curls, arrange on chilled plates or in pretty frosted glass dishes. Decorate with crystallized lemon peel, borage flowers and fresh mint leaves if you have them. Instead of the lemon juice and zest, use 3 tablespoons of elderflower syrup and 1 teaspoon of lemon juice. Proportions will depend on how sweet the flower syrup is. Deep fry “bunch” of elder flower very quickly. We always have lots of crystallized lemon, orange and lime peel in a jar to decorate tarts, scatter on mousses or just to nibble. Put the julienne into a saucepan with the syrup and cook gently until the lemon julienne looks translucent or opaque. Remove with a slotted spoon and allow to cool on bakewell paper or a cake rack. When cold toss in castor sugar and allow to dry in a cool airy place. The Burren Slow Food Festival is coming up and will be launched at the Ballyvaughan Farmer’s Market on 16th May. This year’s theme is Land & Sea. The festival will be extend to a full week of stand-alone events organised by the Burren Food Trail, food producers, chefs and restaurants. Michelin-starred chef Derry Clarke from L’Ecrivain will be making a much anticipated appearance at the festival, sharing his expertise in demos and talks. See www.slowfoodireland.com/event. I’ve got a whole stack of cookbooks on my desk to review, some since before Christmas when almost every post brought another title – so many it wasn’t possible to reach them all. There were several that I was particularly taken with, one was the Lettercollum Cookbook. Author Karen Austin’s story is a particularly intriguing one; she was on her way to Australia, one Christmas when she met Con McLoughlin who brought her to West Cork. She’s not the first and certainly won’t be the last to be totally seduced by the landscape and the people – and the sun shone for the entire week. She and Con got together with a few friends to buy a dilapidated Victorian house with 12 acres of land in 1983. They planned to lead the ‘good life’, get away from pollution and traffic jams and try their hand at sustainable living – on her own admission, they had lots of grand plans and no experience, quite a combo. Years of hard work and lots of fun ensued but it didn’t pay the bills so they decided to open a hostel at Lettercollum House, word quickly spread of the delicious organic food made from fresh vegetables and fruit from their garden. After a couple of years they upgraded to a guesthouse but big houses are like sponges they soak up money – there’s almost always something that requires urgent attention and then one has to start all over again. What to do? In July 2004 they launched the Lettercollum Kitchen Project in the town of Clonakilty, which has become an institution – they cook their beautiful produce in the kitchen behind the shop. They satisfy their yearning to travel by taking groups to France and Spain to cook. The Lettercollum Cookbook is a collection of the beautifully simple recipes that Karen has developed over the years. Karen has travelled from Bali to Cadaqués, Tripoli to Timoleague and brought inspiration for new flavours and ingredients back to West Cork. Her recipes are a blend of Irish cooking with a sprinkling of the exotic. Fodors have named her “master of the vegetarian and ethnic repertory”. There’s a little fish in there too and a hint of chorizo. The book was published by Onstream and many of the beautiful photographs are by Arna Rún Rúnarsdóttir. Preheat the oven to 180C (350F) Gas Mark 4. First, make the spicy potato wedges. Wash the potatoes and cut into quarters – no need to peel. Put into a bowl and toss with the olive oil. Sprinkle with the paprika and chilli flakes and toss again. Season with a little salt. Tip onto an oven tray, keeping in a single layer. Bake for 15 minutes, then give the tray a shake and bake for a further 15 minutes or until lightly crisp. Cut the fish into 2cm pieces. Sieve the gram flour into a bowl together with the salt and baking powder, chilli and spice. Regular flour may be used, but gram gives and interesting batter and means the recipe can be gluten-free. Slowly whisk in some beer until you get a thick pouring batter. The batter should fall off the spoon in a thick stream. If it falls off in lumps, thin it with a little more beer. If it’s too runny, just sieve in a little more flour. Carefully heat the oil in a wok, deep-fat fryer or saucepan. Test it’s hot enough by dropping a cube of bread, piece of onion or other vegetable into the oil. When it comes back quickly to the surface it’s ready. Season the fish with a little salt and drop into the batter, mixing around to cover the fish completely. Carefully lower each piece into the hot oil, cooking no more than 5 or 6 pieces at a time, otherwise the oil temperature will fluctuate too much and the batter will cook unevenly. Turn the pieces after a minute or two, and when nicely browned remove and drain on kitchen paper. Eat immediately with a serving of spicy wedges. For the picada, remove the crusts from the bread and cut into 1cm cubes. Heat a little olive oil in a pan and fry the bread until golden. Put the almonds into a bowl and cover with boiling water for a few minutes, then refresh with cold water. The skins of the almonds should now slip off. Put the fried bread, almonds and garlic into a food processor and buzz to a fine crumb (or mash together with a mortar and pestle). Slowly pour in enough olive oil to make a loose paste. Season with a little salt. Chop the parsley and stir in. Peel and chop the onions. De-seed and chop the peppers into about 2cm dice. Peel and finely chop the garlic. Peel and cut the potatoes into 3cm chunks. In a large pot cook the onions and peppers in a little olive oil until soft. Add the chopped garlic and cook on medium heat for a couple of minutes. Add the potatoes and cook for 5 minutes. Chop or grate the tomatoes on the coarse side of a grater, and add to the pot. Cook gently until the tomatoes break down. Add the brandy or wine, followed by the fish stock. Continue cooking until the potatoes are tender. Season with salt and pepper. Leave to one side. Clean the mussels and remove the beards. Discard any that are damaged or open. Skin the monkfish and cut into medallions about 1cm thick or cut the hake into four steaks – ideally your fishmonger will do this for you. Put the stew back on the heat and stir in 1 tablespoon of the picada. Add the monkfish and then scatter over the mussels. (If you are using hake, cook for a couple of minutes before adding the mussels.) When the stew returns to the boil, turn it down. As soon as the mussels open, remove from the heat. Adjust the seasoning and serve with the remaining picada in a bowl on the side. For the tahini sauce, put the tahini, garlic and lemon juice into a small bowl and mix together. It will become very thick. Thin with enough water to make a thick pouring sauce. Season to taste with a little salt. Soak the dried chickpeas in cold water overnight. The next day, drain them and put them, uncooked, into a food processor and blitz until finely ground. Drain the can of chickpeas and rinse them under the tap. Peel and finely chop the onion and garlic. Heat a small frying pan, add a little olive oil and fry the onions for 2-3 minutes then stir in the chopped garlic and fry for 1 minute longer. Tip the onions and garlic into the ground chickpeas in the food processor together with the canned chickpeas, salt, ground cumin and chopped herbs. Blitz everything until fairly smooth. Tip into a bowl and sieve in 2 tbsp of the gram flour and mix well. We use gram flour as it is gluten-free, but any flour will work. Heat a large frying pan and pour in enough oil to cover the bottom. Wet your hands and form the mix into small burgers – not too thick – and slip them into the pan. If the mix is too wet to stay together, add a little more gram flour and try again. Flip them over and fry on the other side. We serve these at home in toasted pitta bread with shredded lettuce and tomato at the bottom, a burger or two on top, drizzled with the tahini sauce. Pre-heat the oven to180c (350F), Gas Mark 4. Peel the pumpkin or squash and chop into 3cm pieces. Toss in a little olive oil with some salt and black pepper. Tip into a roasting tray and bake for 30 minutes, until the pumpkin is tender but not charred. Wash the kale and strip out the tough stems by pulling the leaf up from the stem – it will come away easily. Chop the leaf into ribbons. Heat a frying pan, add enough olive oil to just cover the bottom and add the chilli flakes, garlic and fennel seeds. Cook gently for a couple of minutes, taking care not to burn the garlic, then add the chopped kale. Stir everything together and cook over a medium heat for 4-5 minutes, until the kale has wilted and softened. Put the cooled, roasted pumpkin pieces into the tart shell and tuck in the kale around it. Crumble the cheese on top. Crack the eggs into a bowl, then whisk in the cream and milk. Season with 1 level tsp salt and ¼ tsp pepper. Pour the mix over the vegetables in the tart shell. Fill as much as you can without it coming over the edge. It’s important that the mix doesn’t spill because it will make the pastry soggy. Bake for 20-25 minutes, until the filling is golden and set. The Happy Pear Café in Greystones is owned by a happy pair of twins called David and Stephen Flynn. After ten years their fans range from young parents to pensioners, ladies-who-lunch to teens-on-the-run, Electric Picnickers to Hollywood stars. They’ve always wowed their clientele on great vegetarian food and now they’ve shared their secrets in “The Happy Pear” Cookbook published by Penguin. Fresh and gorgeous tasting food, bursting with goodness. It’s always fun to see what’s happening on the food scene in New York. This time, I had a cool breakfast in a hip ice-cream parlour called Morgenstern’s down in the East Village. They make a range of pretty delicious ice-creams, but just for a couple of weeks they teamed up with Brutal magazine to do a Brutal breakfast, (proceeds go to funding the next edition of the magazine) – great name but misleading ‘cos the breakfast was totally delicious. Mine was Avocado Toast but of course with a twist, a thick slice of Japanese bread, toasted and spread with avocado ice-cream, a drizzle of condensed milk, olive oil sea salt and freshly ground pepper. How weird does that sound but it was really tasty and morish. My friend had the egg sandwich, we were sitting up at the counter so we could watch as the sweet little cook meticulously put the sandwich together with as much care as if she herself was about to eat it. The combination of semi-soft egg with Aioli, pickled vegetables, sesame oil and fresh coriander on a crusty roll was perky and delicious. Another version had a dribble of Sri Racha, (Thai hot sauce) added. 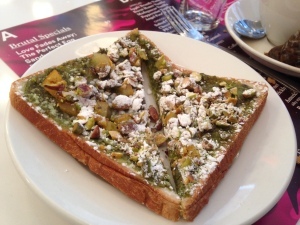 Wished we could have tasted the Salt and Pepper Bread and Butter Pudding with beets, asters and homemade cultured yoghurt but we couldn’t manage it after a matcha, pistachio and marmalade toast! You can eat aster and iris flowers, yes, that was a new one on me too, see ww.morgensternsnyc.com for the ‘blow you out of the water’ ice-cream menu, including raw milk ice-cream – how interesting is that in a New York eatery? Just a couple of blocks away in the same area, there’s another gem, El Rey Luncheonette, great name, owned by Geraldo Gongales the partner of Nicholas Morgenstern who owns Morgenstern’s . I loved the Housemade Za’atar Bread, Egg Frittata with shaved fennel salad and crushed avocado, Green Mole Burrata with burnt onions and Za’atar bread. On Orchard St, you’ll find the Fat Radish, open since 2010 and still great, I loved this concept too, the high ceilinged room with exposed brick walls was packed with a ‘cool kid’ clientele, relishing Saturday morning brunch. The menu is very ‘veggie centric’ as are many of the best and most innovative ‘farm to table’ places in New York at present. It such a joy for a farmer and gardener like me to see the long overdue move of vegetable and grains to the centre of the plate. They’re open for lunch and dinner too, don’t miss the Fat Radish Plate of seasonal market vegetables or the smoked salmon crostini, capers, red onion, upland cress, crème fraîche. One can imagine the truffled duck fat chips are also a “must have”. It’s not surprising that they are so popular, perhaps it is psychological but I just feel a boost of energy every time I have one. Razor clams and sea urchins were featured on many menus including at Eataly (www.eataly.com/nyc) where they were also piled high for sale in the seafood section. We had delicious deep fried chickpeas with smoked paprika at Tía Pol – an enduringly popular tapa place, another to add to your New York List www.tiapol.com. Toast the slice of bread, immediately spread with a layer of avocado ice-cream. Drizzle with condensed milk, then extra virgin olive oil. Sprinkle with a few flakes of sea salt and add a generous grind of freshly ground black pepper. Serve right away, a delicious contrast of hot and cold and surprisingly moreish. What a surprise – this delicious ice-cream can be served in a sweet or savoury combination. Scoop the flesh from the ripe avocado into a blender; add the lemon juice, milk and sugar, whiz until smooth. Transfer to a bowl and stir in the cream – mix well to combine. Taste and add a little more lemon juice if needed. Freeze in a sorbetiere or ice-cream maker, it won’t take as long as other ice-creams – maybe 15 minutes. Serve immediately or store in a covered bowl in the freezer. Split the fresh crusty roll horizontally. Spread both sides with the aioli. Slice the semi-hard boiled eggs lengthwise and arrange three side by side on the base of the roll. Season with salt and freshly ground black pepper. Top with pickled carrots and radish slices and a little pickle juice, a layer of coriander leaves on top, then a few drops of sesame oil. Season once again with a few flakes of sea salt and pepper. Cover with the roll. Press gently and cut into two pieces and serve immediately. Each sandwich was made to order. Melt the butter over a medium heat, add the oats and cook 5-7 minutes, stirring until slightly toasted. Pour onto a baking tray and allow to cool. Cream the remaining butter and sugars in a bowl or food mixer. Add the peanut butter and mix until combined, add the oats, then flour and bread soda, mix until smooth. Chill the dough in a freezer for 5 minutes. Put a sheet of parchment paper onto the work surface. Put the dough on top, add a light dusting of flour to keep the dough from sticking. Top with another large sheet of parchment and roll the dough until 5mm (¼ inch) thick. Cut the dough into 6cm (2½ inch) cookies and space 1cm (½ inch) apart on an ungreased baking sheet. Bake for 20 minutes, turning the baking sheet halfway through baking, then transfer to a cooling rack. Mix the butter, sugar and peanut butter in the bowl of a food mixer until smooth. Sandwich two cookies together with the filling. Enjoy. Theodora Fitzgibbon was a legend in the Irish food scene for many years, an urbane sophisticated woman who led a thrilling life, in Europe, the Middle East and India. I’m greatly enjoying and in fact enthralled by her beautifully written autobiography “A Taste of Love” published by Gill and Macmillan. Zamora Restaurant & Wine Shop presents the first of its Food & Wine Tasting Events on Monday 20th of April 2015 at 7pm, tickets €49. Enjoy the delights of Burgundy presented by Edouard Leach of Maison Francoise Chauvenet showcasing the best Chardonnay & Pinot Noir from this magnificent region. These wines will be paired with tasters and teasers from the Zamora kitchen team under the direction of Pat Browne also of Ballymaloe Cookery School.There is limited availability for this event so book early on 021 239 0540. Another great new find: Mr Jeffares Irish Blackcurrant Cordial. The Jeffares family has been growing blackcurrants in Wexford for three generations, today Des Jeffares continues this tradition, cold pressing and bottling blackcurrants at their peak so you can enjoy Mr Jeffares Irish Blackcurrant Cordial. 100% natural pure juice, sweetened with Stevia, a natural sugar alternative, no artificial colours, flavours or preservatives. See www.mrjeffaresblackcurrants.ie. Easter is early this year so the milk fed Spring lamb will be even more juicy and succulent. It needs nothing more than a few flakes of sea salt before being popped into a moderate oven to roast to melting tenderness. Search for the first little sprigs of fresh mint to make a sauce to accompany it for Easter Sunday lunch. Lamb sweetbreads are also in season. If you haven’t cooked or tasted them before, pick up courage, order some from your local butcher, they are a rare treat that you will find on the menu of top restaurants nonetheless they are amazingly inexpensive to buy partly because so few people know what to do with them. Take advantage now, like lamb shanks and ham hocks, the price will go up before too long. Wild garlic is also in season now so try the combination of sweetbreads with wild garlic. This is also the very best time of the year to enjoy lamb’s liver and kidneys –tender and mild, cooked in minutes, packed with vitamins, minerals and of course iron. When did we stop loving liver? Could it be partly because it is cheap and so is undervalued? Remember kids learn many of their food preferences from their parents who influence them inadvertently. Having said that, at least one of my daughters can’t be persuaded that it is super delicious. If you’ve been off sugar for Lent – bet you feel very virtuous and possible a heck of a lot more energetic so I shouldn’t be trying to tempt you but who could resist Pamela Black’s Easter Chocolate cake full of speckled eggs – a spectacular centre piece for the Easter Table. Sweetbreads are definitely a forgotten treat. The salty tang of the anchovies in this recipe gives another dimension and adds lots of complementary flavour without compromising the sweetness of the sweetbreads. Put the sweetbreads into a bowl, cover with cold water and let them soak for 3 hours. Discard the water and cut away any discoloured parts from the sweetbreads. Dice the carrot, onion and celery and sweat them in butter; add the bouquet garni. Then add the chicken stock and bring to the boil. Poach the sweetbreads gently in the simmering stock for 3–5 minutes or until they feel firm to the touch. Cool, then remove the gelatinous membranes and any fatty bits carefully. Press between 2 plates and top with a weight not more than 1kg (2lb) or they will be squashed. Wash and dry the lettuces and salad leaves and whisk together the ingredients for the dressing. Slice the sweetbreads into escalopes, dip in well-seasoned flour and then in beaten egg. Sauté in a little foaming butter and oil in a heavy pan until golden on both sides. Toss the salad leaves in the dressing, divide between 4 plates and lay the hot sweetbreads and then potato crisps on top of the salad. Sprinkle with chopped anchovy and wild garlic flowers or chive flowers and serve immediately. a ton of crisps and nothing you buy in any shop will be even half as delicious. A mandolin is well worth buying for making chips – but mind your fingers! When these are served with roast pheasant they are called game chips. Wash and peel the potatoes. For even-sized crisps, trim each potato with a swivel-top peeler until smooth. Slice them very finely, preferably with a mandolin. Soak in cold water to remove the excess starch (this will also prevent them from discolouring or sticking together). Drain off the water and dry well. In a deep-fat fryer, heat the oil or dripping to 180ºC/350ºF. Drop in the dry potato slices a few at a time and fry until golden and completely crisp. Drain on kitchen paper and sprinkle lightly with salt. Repeat until they are all cooked. If they are not to be served immediately, they may be stored in a tin box and reheated in a low oven just before serving. Cut the kidneys in half, remove the “plumbing” and cut each one into four pieces and wash well. Heat a little extra virgin olive oil in a small frying pan, add the kidneys and cook for a minute or two, tossing them occasionally. Add the sherry, allow to bubble for a moment and follow up with a splash of wine or cider vinegar. Stir in the redcurrant jelly, Worcestershire sauce, cayenne pepper, and mustard. Season with salt and plenty of freshly ground black pepper. Add the cream and bubble for another minute or two, shaking the pan occasionally until the sauce is slightly reduced. Taste and add more cayenne and black pepper and lots of parsley if you like. Serve on char-grilled sour dough bread with some sprigs of watercress. For a more substantial supper dish, serve with plain boiled rice and a crisp green salad. Garnish with a sprinkling of chopped parsley. This is a bit more fiddly to make but the end result with contrasting flavours and textures makes a seriously impressive starter. Prepare and cook the shallots as described in the recipe. Whisk together the ingredients for the dressing and leave aside. Wash and dry the lettuces, tear into bite sized pieces and keep in a salad bowl. Peel the potato and cut into fine julienne strips on a mandolin, in a food processor or by hand. Wash off the excess starch with cold water drain and pat dry. Preheat oil in a deep fry to 200ºC/400ºF. Cook the dry potatoes until golden brown and crispy. Keep them warm to serve with the salad. Just before serving: Heat the olive oil in a frying pan, allow to get very hot. Season the kidneys with salt and pepper add to the pan and cook according to your preference. Sprinkle with chopped marjoram – don’t overcook them or they will become tough and rubbery. While the kidneys are cooking – quickly toss the lettuces with the dressing and place on 4 plates. Put the warn shallots around each pile of salad, arrange the fried potato carefully on top of each shallot in a little pile. Finally sprinkle the cooked kidneys straight from the pan onto the salads. Serve immediately. Put the shallots, butter, water, sugar, salt, pepper and herb into a saucepan. Bring to the boil and simmer covered until the shallots are almost tender. Remove the lid, allow the juices to evaporate. Watch and turn carefully as the shallots begin to caramelize. Cut the lambs liver into 4cm (1½ inch) cubes. Dip the cubes of liver in well-seasoned flour and lots of freshly cracked pepper. Shake off the excess. Cut the bacon /rashers in half crossways , stretch with a knife, wrap around each piece of liver and secure with a cocktail stick. Cook in a preheated oven at 250°C (500°F) for 5-6 minutes or until the bacon is crispy and the liver still a little pink in the centre. Serve on a bed of watercress sprigs. Cream the butter and sugar until light and fluffy. Add the eggs and vanilla extract a little at a time, beating well after each addition. Fold in the sieved flour and baking powder carefully and add a little milk if required to give a dropping consistency. Spoon into prepared tins and spread evenly. Cook in the preheated oven for 20-25 minutes. Beat the butter until soft. Add the icing sugar and cocoa powder slowly. Finally add the vanilla extract and hot water – mixing all thoroughly. Once cooled, add 3 tablespoons (4 American tablespoons) of butterscotch sauce to the buttercream and mix thoroughly. Taking a 10cm (4 inch) round cutter, cut a disc from the centre of one of the two sponges (keep aside and use for a mini cake). Spread 2 tablespoons (2 1/2 American tablespoons) of the buttercream over the base of the remaining sponge. Place the cut sponge on top and cover all the surface completely with remaining icing. Allow to chill for 1 hour. Place the cake on a parchment lined baking sheet and quickly press the chocolate sprinkles and chocolate caraque into the sides, over the top and into the hollow of the cake – it should now resemble a birds nest. 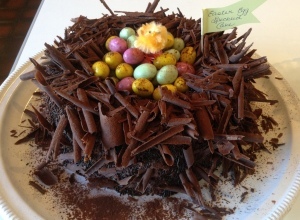 Fill the centre with speckled eggs and decorate with fluffy chicks. Keeps for months and is delicious drizzled over ice-cream, crêpes, yoghurt….. Put the butter and sugar into a heavy-bottomed saucepan and melt gently on a low heat. Simmer for about 5 minutes, remove from the heat and gradually stir in the cream and the vanilla extract. Put back on the heat and stir for 2 or 3 minutes until the sauce is absolutely smooth. Allow to cool. Melt 150g (5oz) of chocolate in a Pyrex bowl over simmering water (not boiling) and stir until smooth. Pour the chocolate onto a flat baking sheet, and tap the tin gently to spread. Allow to cool. Once cool, using a cheese slice, or the blade of a chopping knife, pull the blade across the chocolate creating “curls” as you go. Seakale is rarely found in shops, it’s a sublime vegetable, every bit as precious and rare as new season’s asparagus but available during the “hungry gap” in April when the winter vegetables are almost over but the summer vegetables are still barely seedlings. We’ll have a limited amount for sale at the Ballymaloe Cookery School Organic Farm and Garden stall at Midleton’s farmers market from next week. Order ahead 021 4646785 to be sure to get some. The Galway Food Festival, is in full swing over the Easter Bank Holiday Weekend, 2-6 April. Building on last year’s huge success there’s a jam packed programme of open-air markets, foraging trip, food trails, talks, tours, tastings, demonstrations, workshops, lots of fun for all the family…See www.galwayfoodfestival.com . Café Sandwiches and Salads, Teashop Cakes and Biscuits, 10 Great Brunch Recipes… We have a series of half-day special interest courses coming up in April at The Ballymaloe Cookery School. For those who are considering going into the food tourism business, there is an intensive one week Start Your Own Guesthouse course from Monday April 20th to Friday April 24th. See www.cookingisfun.ie.